MIAMI (CNS) — Exactly one week after citing an “urgent need” for donations, the Archdiocese of Miami loaded 22 pallets of rice, canned goods, hygienic supplies and diapers onto a ship for transport to Haiti’s southwestern peninsula, hardest-hit by Hurricane Matthew in early October. “And more to come,” said an elated Father Reginald Jean-Mary, administrator of Notre Dame d’Haiti Mission in Miami’s Little Haiti, as he watched an army of volunteers packing, wrapping and loading the donated goods onto pallets. A total of 47 pallets were being taken to Haiti on the Betty K VII, a cargo ship called a “pallet carrier” provided by Seacoast Shipping that set sail Oct. 16 and was to arrive in Miragoane, on the peninsula’s northern coast, around Oct. 19. From there, the Haitian Catholic Church’s relief agency would transport the supplies overland to its local affiliates in the areas that bore the brunt of Matthew’s fury: Jeremie in the peninsula’s northwest and Les Cayes in the south, as well as Mole-Saint-Nicolas in the remote northwestern tip of the country. “It’s a beautiful day,” said Father Jean-Mary as he stood in his church’s parish hall, which until an hour earlier had been brimming with relief supplies. “In one hour, everything has been packed. That’s the beauty this morning, the solidarity of the people,” he said. His volunteer army consisted of adults studying Creole and English literacy in the Pierre Toussaint Center on the parish grounds — a program offered by Miami-Dade County Public Schools. All of the students are Haitian, and they learn to read and write in their native Creole before being taught English. 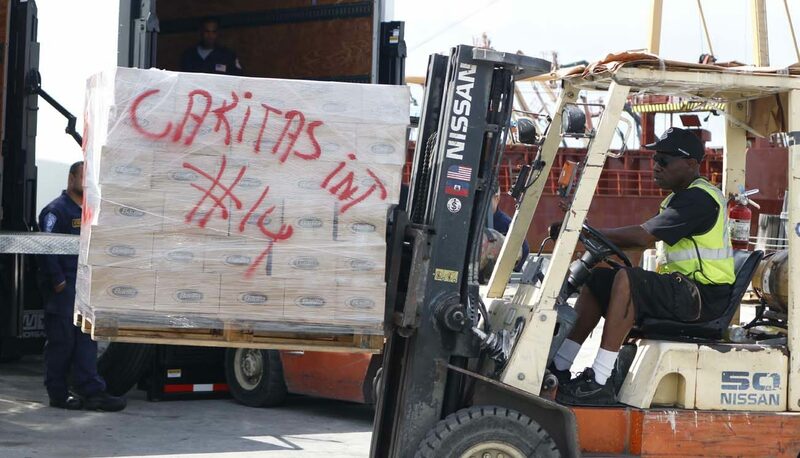 He noted that Seacoast Shipping, which offered to transport up to 60 pallets for free, is owned by Haitian immigrants who have succeeded in Miami. So is Diakonos International, one of two companies that donated a 40-foot shipping container each for future trips. Father Jean-Mary also was alluding to the billions of dollars that poured into Haiti after the 2010 earthquake, which resulted in little noticeable improvement in the lives of the people. The experience created a lot of frustration — among Haitians as well as donors and the relief agencies themselves. With everyone determined not to repeat the experience, Father Jean-Mary offered a solution: the Catholic Church. “Where NGOs don’t go, who’s there? The church,” he said, using the abbreviation for nongovernmental organizations. “There are some areas (in Haiti) you don’t see the government. Who do you see? The Catholics, the Protestants. “If you want to reach those people, you have to use those channels,” he told the Florida Catholic, newspaper of the Archdiocese of Miami. Besides the total of 60 pallets making their way to Haiti courtesy of Seacoast Shipping, a container’s worth of food, generators and medical supplies donated by a synagogue in Boca Raton was bound for Haiti in a week’s time, along with whatever has been collected by Miami-Dade County Public Schools, which along with city of Miami fire stations have set up drop-off sites for donations. But Notre Dame d’Haiti planned to stop accepting material donations Oct. 22, Father Jean-Mary said. That’s when the Miami archdiocesan relief effort will move to its second phase: collecting building supplies and money. Especially money. A special collection was taken in every archdiocesan parish the weekend of Oct. 8 and 9. Individual donations also are being funneled through Catholic Charities of the Archdiocese of Miami, which can coordinate the bulk shipment of supplies and work directly with church partners such as Caritas in Cuba and Catholic Relief Services in Haiti. “That’s why we need money also, for the transportation,” Father Jean-Mary said. He added that backpacks and school supplies also will be needed, and Miami-Dade County Public Schools will continue to collect those. “The best thing for the children in Haiti is to continue (with their lives), to go back to school,” Father Jean-Mary said. But even then, money is king. “If we have money, we can buy backpacks from many companies at a lower price,” he said. Donations may be made through the Catholic Charities website, www.ccadm.org. Click on the “Donate” tab, then on “General Donations” and under the “supporting” box select “Disaster Relief –- Hurricane Matthew.” Donations via check may be made payable to: Catholic Charities of the Archdiocese of Miami, 1505 NE 26 St., Wilton Manors, FL 33305. Please note “Disaster Relief — Hurricane Matthew” in the memo line. Rodriguez-Soto is editor of the Florida Catholic, newspaper of the Archdiocese of Miami.